Puri, who was recently on trial at Kilmarnock, will train with the squad ahead of the League Cup final. St Mirren manager Danny Lennon is considering signing Sander Puri on a short-term contract. The 24-year-old Estonian winger, who is a free agent after leaving Finnish side KuPS in January, will train with St Mirren this week and could sign before Sunday's League Cup final. Puri had previously been on trial at Kilmarnock but was not offered a deal by Kenny Shiels. "We have had Sander in training and we will monitor him very closely," Lennon said. 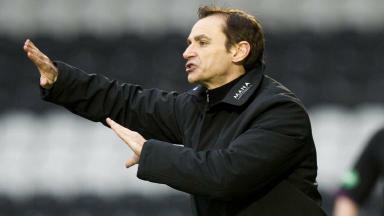 "We are always interested in good quality players and he certainly comes with that pedigree and has a CV to back it up. "We like what we see so it's looking promising. "Not just us, but it also gives him the opportunity to get a feel for our football club and make sure it's right. I wouldn't envisage a problem with that. "We will monitor it in the next two or three days and then we will make a decision." If a deal is agreed, the 47-times-capped winger would be eligible to play in Sunday’s League Cup final if his international clearance is received in time. Puri, who counts Larissa and Levadia Tallin among his former clubs, spent time on trial with Celtic in 2009.